As too often happens, work robbed me of most of the joy of the festive season but that didn’t stop me from enjoying a couple of rather nice bottles both as a festive treat and as a slightly belated celebration of my mum’s birthday. Given that she’s a big fan of fish, I’d lined up a bottle of Dom Pérignon and a bottle of Barboursville Vineyards’ Reserve Viognier to pair with a pescatorial pre-Christmas dinner. Despite the scale of its production and of its producer, I’ve always had a soft spot for Dom Pérignon and, in honour of mum’s birthday, I thought I’d open one of my last bottles of the 1985 vintage. I’ve not had the pleasure of trying a vast number of other vintages, but of those I have enjoyed this one has long been my favourite. It had been quite a few years since I last opened a bottle and needless to say I really looked forward to it. Faintly amber-tinged gold in colour with a fine and still persistent bead, it undoubtedly displayed its maturity. A smokey, toasty, lemon pith nose with a hint of bruised apple, roasted nuts and cocoa nibs, was rounded off by a gently mushroomy autolytic note. Dry on the palate, the fruit was still citrusy and bright although it was starting to display a touch of oxidation. Smooth and soft mousse, medium bodied yet rich, with a firm acidity that balanced the slightly sweet ripeness of the fruit. There was a smokey, savoury edge to the richness of fruit that continued through the finish. Very, very long with a symphony of sweet citrus, earthy, smokey and mushroom notes. Although 28 years old, I was very sad to see that my favourite vintage of my favourite Champagne was definitely mature. A little too long in the tooth, if I’m being totally honest with myself. Delicious still, but drink now. In a twist of fate that wholly inaccurately portrays my life in a very glamorous light, I was fortunate enough to be served Krug’s 1985 vintage Champagne just a few days later. The comparison was fascinating: the Krug was even more evolved than my Dom Pérignon of the same vintage, and the gentleman who was generous enough to serve it was just as saddened as I had been by the news. 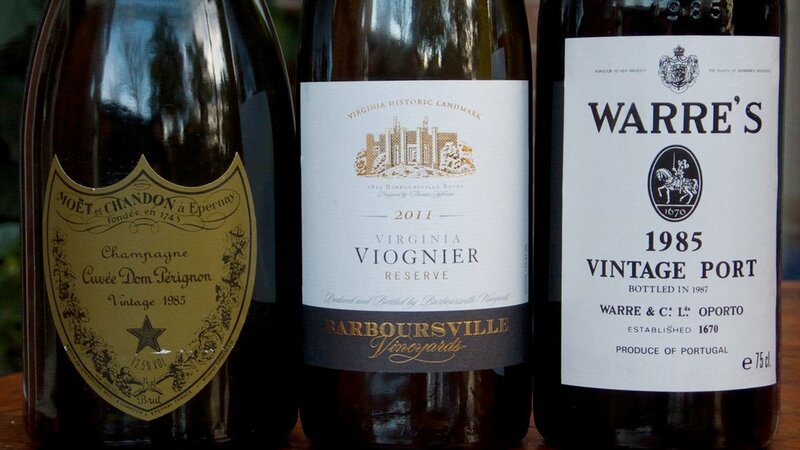 I wrote about the 2011 Barboursville Vineyards Reserve Viognier in my recent post on Virginian wines (you can read it here) and I won’t bore you further by repeating myself; suffice to say it was just as good this time as it was then and it accompanied the skate beautifully. Every Christmas I bring a selection of bottles of port out of the cellar and every year my general level of overindulgence means that they are returned unopened to their cases in January. However, this was still Christmas Eve and we’d had a reasonably light dinner in anticipation of the hearty meals that would fill the next couple of days. We hadn’t made a dessert and, when a cheese course was suggested, it seemed a shame to waste the opportunity to enjoy a bottle of port alongside it. As I said, I had a few to choose from, but the consensus around the table was to open a bottle of Warre’s 1985. Had I put a little more thought into planning the meal I would have served another 1985 (a Bonneau du Martray Corton Charlemagne, the only other wine in my collection from this year) instead of the Viognier to complete the vintage trio, but two out of three certainly wasn’t bad going. The Warre’s had been allowed to settle on the off chance it was required, but it was only opened and decanted when the cheese was served. Medium garnet in hue, it no longer displayed the opaque, violet-shaded colour of its youth. Its nose was sweet and spirity, displaying inviting liquorice aromas and peppery, raspberry fruit. The palate was also soft and spirity, displaying moderate tannins and firm, peppery acidity. Liquorice and raspberry flavours carried through from the nose. A touch fiery on the mid palate, but fruity finish was long, harmonious and well balanced. Drying out a little at twenty-eight, but after an hour in the glass its vivacity shone through proving that it still had plenty left to give. This will continue to drink well over the next five to eight years, so I’ll have to make more of an effort to drink the rest of the case come Christmases future. I hope you’ve all had a lovely Christmas and I wish you all the very best for 2014.